Ok my time is about up for the final decision for color combo on my. I am torn its either Pewter/Ash, Brilliant Silver/Ash or Pewter/Charcoal . These are listed from first to last choice. I know its a personal prefrence on color choices any feedback would be appreciated. I really want Pewter/Ash but think that the colors are a little drastic since the Ash is so light in color. Thanks for any advice. Pewter/stone was my choice because I like a light interior & the beige goes well with the brown wood. Not a very common combo, so it stands out. There are A LOT of Brilliant Silver E's out there. Will that bother you? Last edited by Barry45RPM; 09-16-2004 at 11:40 PM. I'm always a fan of dark interiors, its more calming for me I guess. They are all beautiful in their own way. Lighter interiors wil have more maintenance. Its a completely different look. But I've never had a single car with a light interior. Tough call. If I had to personally pic one of those options, I'd go with pewter/charcoal. I love silver, but I see it sooo much here in OC. What's wrong with using the identical set up you now have on the Jetta? I had that same set up on my '02 Wagon, and wish I had it now on my E-300. That Alabaster White is nice, but the light colored Stone interior is too hard to maintain. So we'll be going darker when we order our new CDI. I ordered a W211 today, and opted for Pewter/Ash. I live in Central California, and a black interior makes to car too hot. I was looking at Desert Silver/Stone, but I think the stone interior is so light that maintanance will be a headache; I'd call it a cream color. Desert Silver looks too gold in person for me. I'd like a lighter color than pewter, one that splits the difference between silver and gold the way that Linen Grey Metallic did in the old Porsches, but pewter has the right chroma, even if the value is a little dark. I'd like a slightly darker, a lot and more earth-toned interior than ash, but it's not available. You know, years and years ago I had a Porsche 928 in a non-standard color. Porsche said that it was a Mercedes paint, and they called it Anthracite. It was a dark metallic grey full of gold flecks. I thought it was a great color. Anybody know if it's still available on any Merc? Last edited by Brav; 09-17-2004 at 12:23 AM. You got that right, bro, especially with the strip of carpet along the door sills, the carpeted dead pedal and even the bottom edge of the door pocket, if you happen to kick it with your shoe. The Desert Silver exterior, though, never seems to show dirt - my usual reason for washing the car is to remove brake dust from the wheels, not dirt from the paint. You could probably say the same thing for any medium tone, though. There are 6 silver/charcoal ML's/E's/C's on my street in Yorba Linda. Silver is nice, but everyone seems to have it. I ordered (employee purchase) a pewter/charcoal E320; hope to find out soon whether it's goint ot be a dealer stock or factory order. Well.... Looks like its a toss up between Pewter/Ash and Pewter/Charcoal. I having second thoughts about the charcoal only beacause I have black leather in my Jetta and its HOT in the summer months. Do you think that Pewter/Ash would make a great color combo? I guess that I will have to make my way to the MBZ dealer to take a look at the colors again......... Thanks for all the input and suggestions keep them coming anything will help at this point. Actaully, I second Barry's suggestion. I think Pewter/Stone is better than Pewter/Ash or Pewter/Charcoal. HOWEVER, if you are a messy guy and dont always keep your cabin clean, DON'T get Stone or Ash. I dont think Ash looks too good with Pewter, they are on different color tone. Charcoal is just charcoal, it will look fine on almost any color. The Stone matches VERY well with Pewter (I saw one the other day at the dealership with this combo and it looks very nice). If I HAVE to choose one of your pick, it will be Pewter/Charcoal. Its a Mercedes, it has a pretty good Air Con!! Heat is not a big factor!!! If you do choose to go for a 'light' interior I would thoroughly recommend you consider some form of protection package. The rear of our vehicle is used mainly to convey a very spoilt, long-haired German Shepherd. His main colour is black closely followed by 'mud'. We just let the car dry out and give it a good vacuum, then clean the inside of the windows. As you can see, the vehicle is as clean today, as it was when purchased. The only thing not in the picture is the rubber insert. The drivers door insert just needs a damp sponge to clean off the shoe scuff marks. Brilliant Silver/Charcoal. Make sure you get the apprearance package as well. I have the Desert Silver/Stone combo and love the interior! It does require some maintenance - especially those door sills ( I never knew that I dragged my feet so much!!!). I Scotchgarded it right after deliver (Oct 2002) and have had it cleaned and re-Scotchgarded each Spring after the ravages of the New England winter - mainly mud, sand and slush from the roads! The interior still looks great and everytime I sit in the car I just look around like a big kid with a new toy - I wouldn't have any other color! I've actually had more problems with scratching the wood than I have with the carpets getting dirty - the center console inlays look beat up for some reason! As with any decision, it's all personal, but I wouldn't not chose the stone simply because you're afraid it may be too hard to keep clean - if you like it then go with it - it's great! Those are all good combinations, but the charcoal is easier to keep clean and there have been problems with dye transfer and scuffing with the ash. If you have a choice about the wood, I like the black birdseye with the ash or charcoal. Pewter/Charcoal. Nice color combo, and has the advantage of not beeing too common. 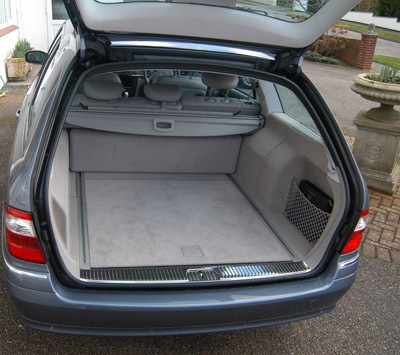 Pewter/Ash is not a bad idea either, but get the Charcoal floor mats if you do. Pewter is a beautiful choice. If you wear polished shoes, you'll regret ever getting Ash interior. My wifes Ash CLK430 Cab is a mess around the doors and lower sill. NOTHING gets the shoe polish off. The problem still exists on my Charcoal E55 but you cannot see them unless you look very closely. Surprisingly, the Charcoal interior is not hot at all. In all my pontification about the stone interior I forgot to add my 2¢ about the colors you were actually considering! I think the Pewter/Ash looks great - and the Ash can't be as hard as the Stone to keep clean, so my prior comments hold! I have a cubanite silver(Euro colour) /Black Leather. altthough I had my doubts to start.It looks superb. It's also a dream to keep clean compared to my old quartz interior! I've got Pewter/Charcoal and am very happy with it. My previous car was an Audi A6 with a light beige interior, and although it may have kept the interior a "little" cooler than the charcoal, is was hard to keep clean. The MB has a very effective climate control system IMO, and with the ventilated seats, I am usually very comfortable even when the temp is in the 90s (which has been very rare in Chicago this year). Good luck with your decision. NOTHING gets the shoe polish off. "Energine" a naptha solvent (used for dry cleaning and other things) is safe for most fabrics and should work. First, try to be very careful mixing grey/silver tone exteriors and the ash grey interior. Different shades can conflict and conspire to make each (both interior and exterior look worse). Second, the black finished wood does look very good with the ash. And the appearance package is a not a bad deal, especially on an E320/E350 where it is the only way to get Airmatic. It is not available on the CDI. Third, I have seen Pewter with all three interior colors and think the either the stone or the charcoal is ok, however the ash does clash with the pewter IMHO. How about the new for '05 grey? I have Pewter/Ash and get a lot of compliments on the combination. Use Woolite and/or 303 spot carpet cleaner. I Scotchgarded the mats as well and they clean very nicely. Everything still looks new. No spots or stains at all. I do keep on top of it and there is no doubt that a darker interior is easier to keep clean. PS - Get the wood wheel. Is it safe for the door panels and the plastic at the door sill? So I am going with Pewter/Charcoal Now do I get Black Birds Eye Maple or Walnut Burl Wood?? You guys must think that I am driving you nuts with all the questions !! Nuts, Who Us? No way! Burl Walnut is standard trim with that combination, isn't it? Should be a beautiful interior!